Background: Home blood pressure (BP) monitoring is the self-measurement of BP in the home environment. It is complementary to 24-hour ambulatory BP, for better diagnosis and management of patients with high BP. Home BP monitoring is in widespread use, but variation in monitoring protocols could lead to inaccurate assessment of BP. 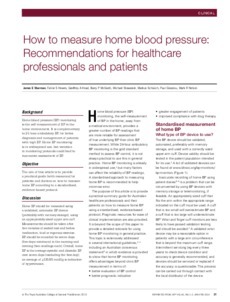 Objective: The aim of this article is to provide a practical guide (with resources) for patients and doctors on how to measure home BP according to a standardised, evidence-based protocol. Discussion: Home BP should be measured using a validated, automatic BP device (preferably with memory storage), using an appropriately sized upper arm cuff. Measurements should be taken after five minutes of seated rest and before medication, food or vigorous exercise. BP should be recorded for seven days (five days minimum) in the morning and evening (two readings each). Overall, home BP is the average systolic and diastolic BP over seven days (excluding the first day); an average of ≥135/85 mmHg is indicative of hypertension.